I could not wait to get my hands on The Witch Is Back since the previous book, Witchful Thinking, ended with such a jaw-dropping event! In The Witch Is Back, Jolie finds herself back in time, in her old life where she owned a shop as a fortune-teller. This Jolie hasn't met Rand or Sinjin yet and she has no memory of being Queen of the Underworld, since technically none of it has even happened yet. Most of this book is like a huge do-over; a chance to see what could have happened if Sinjin had met Jolie first, not Rand. It's safe to say that this book left me with more conflicted feelings than I have ever felt before. I was VERY excited for Sinjin to get his chance with Jolie, since I absolutely adore him and have always wanted more to happen between them. I was not disappointed, because these two shared some very intense moments together and it is very clear that they have chemistry and that Sinjin does feel very deeply for Jolie. But at the same time, I was a little peeved at him. Sinjin finally reveals his reasons--very legitimate and understandable reasons--for going back in time and altering the path of Jolie's future/fate, but some of his actions are still unforgivable and frustrating. But then again, I feel bad for him on some levels and I can't help but have a soft spot for him. Plus, he made me swoon with all of the terribly sweet and sincere things he said to Jolie throughout the course of the book....See what I mean about feeling conflicted?! Everything in this book is so off kilter and poor Jolie is forced on an emotional roller coaster. Especially when Rand shows up to rescue Jolie and brings up confusing and undeniable feelings in her. She knows she cares for Sinjin but she can't understand why she has such a familiar pull towards Rand, especially when she's been warned to stay away from him. I liked how Rand's presence proved that some bonds just can't be broken, but I also think that everything that Sinjin and Jolie experienced together can't be easily erased either. Ultimately I felt bad for Jolie, Rand and Sinjin when the truth was finally revealed to Jolie because so much had happened that couldn't be undone, and all of them were left with some emotional scarring. This book left me a little broken-hearted as well, to be honest! 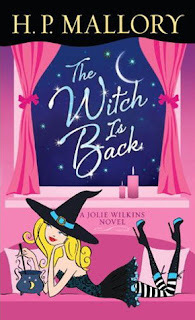 I'm very excited to get my hands on Something Witchy This Way Comes, which is the next and final book in the series. I don't know what Jolie's fate will be, but I know I can count on there being more of her delightfully funny inner monologue to keep me laughing. And of course I'm looking forward to more action, romance, suspense and revelations! I can't wait to see who Jolie will end up with, once and for all.